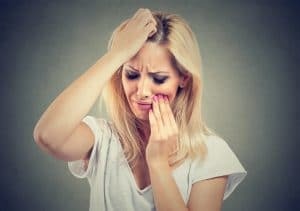 Problems with dental pain and sensitivity can be alarming, and intrude on your day, but some people may try to ignore the problem instead of bringing it to their dentist’s attention. Ignoring discomfort does more than just put you at risk for letting a problem go without diagnosis. By the time you seek care, complications may have arisen. Your Livonia, MI dentist is ready to help you take care of a problem that is causing you discomfort. Modern restorative dental treatments can lead to fantastic outcomes, as you can have your issue fully remedied, and receive a life-like dental filling or dental crown. You should know that your dentist may also be able to provide help if you are experiencing pains in your jaw, face, head, or neck. If you have a toothache because of a cavity, you may need a root canal treatment to put a stop to the issue. Root canals take care of problems that are internal, and affecting the living tissue in your pulp. Your dentist will offer a modern, comfortable environment for your root canal, and restore your tooth with an attractive crown. If you want to reduce the chances that a cavity will reach this stage, make sure you attend routine dental exams. Are You In Pain Because Of TMJ Dysfunction? Recurring headaches, along with pains in your face, neck, and jaw joints, are all symptoms of TMJ dysfunction. This condition is something that your dentist can identify during an exam. An oral appliance may be able to relieve you of discomfort, as this custom insert will help you keep your jaw joints in a relaxed position. James Stewart, DDS is ready to help patients who are experiencing dental pain. When the source of your discomfort is identified, and treated, it can lead to a terrific recovery. We proudly work with residents of Livonia, MI, as well as Farmington Hills, Farmington, Plymouth, Northville, Novi, Dearborn Heights, Dearborn, Garden City, Westland, Redford, and the surrounding communities. To schedule a consultation, call our office today at (734) 425-4400.